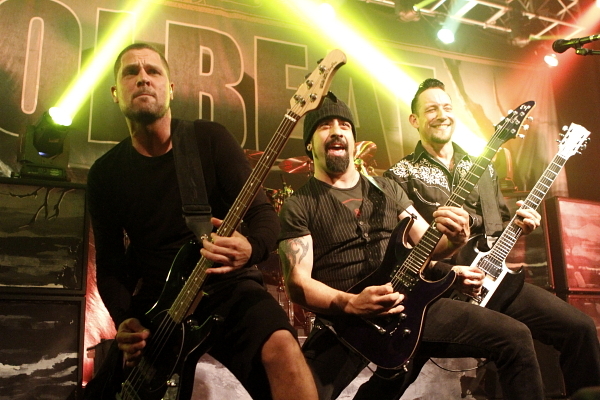 I caught Danish Rock Band Volbeat at Manchester Academy during their ‘Outlaw Gentlemen & Shady Ladies’ tour. With American metal band Iced Earth as the main support act and London based Punk Rockers The Howling being opening act on the UK leg of the tour I was expecting a spectacular show and I wasn’t disappointed. I arrived to join a long queues but luckily made it in just in time for The Howling but with no time to get a drink! One has to get one’s priorities right and The Howling came first! A short intro led into Outsiders, Blacky swaggered on to the stage in a black/animal print reversible hoodie, chewing gum, bottle of beer hanging out of back pocket exuding cool. Next up came Pitbull (my personal favourite) a really catchy song that makes you want to get up and pogo! The Rev was certainly jumping, kicking and pouting and still managed to play some amazing riffs. The Howling’s Jackyboy giving the drums some stick! 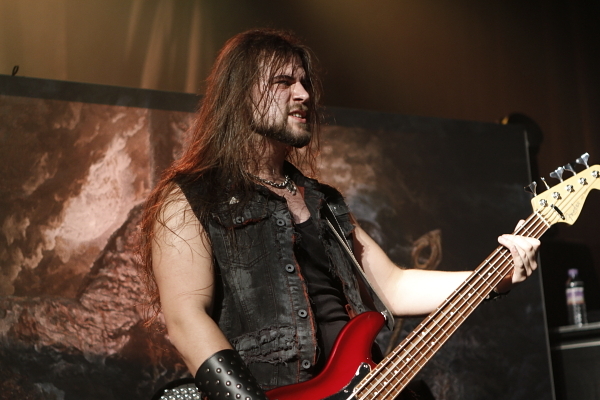 Iced Earth blasted on to stage to Plagues of Babylon and Stu shouting show us your horns! These guys look like tough Hells Angels in oily denim and greasy leather with masses of hair! Formed back in 1984 which is a good few years before ‘local lad’ and newest member Luke Appleton on bass was born. 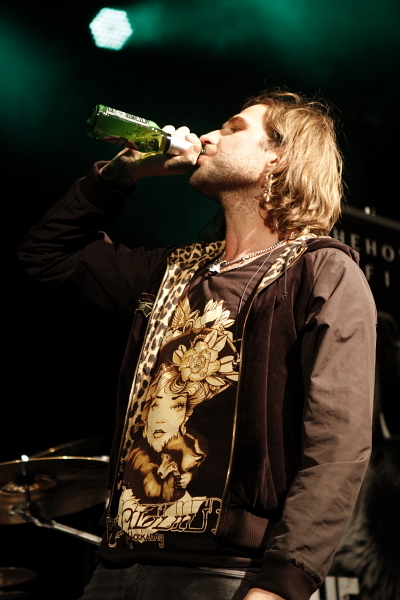 Having seen Luke on smaller stages with Fury UK and depping for Absolva it was fantastic to see him on the big stage with an already well established heavy rock band – living the dream! During Dystopia Stu’s voice showed an amazing versatility in range, in places sounding high pitched, a bit like Geddy Lee (Rush) on helium. If I Could See You was a lot slower but still very metal. For V Stu donned a Guy Fawkes style mask and encouraged lots of fist pumping from the audience. Burning Times with it bell tolls reminded me of Metallica’s For Whom the Bell Tolls. 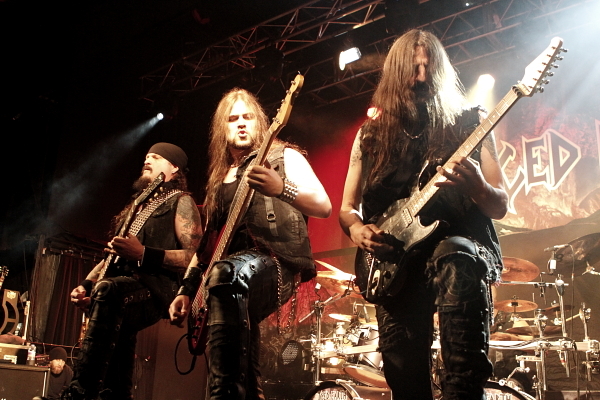 Finishing off a great set with the self titled Iced Earth. Correct me if I’m wrong but I don’t seem to hear much about Iced Earth and I don’t recall seeing much of them on Scuzz or Kerrang TV – yet they have been going for nearly thirty years and have released ten studio albums! 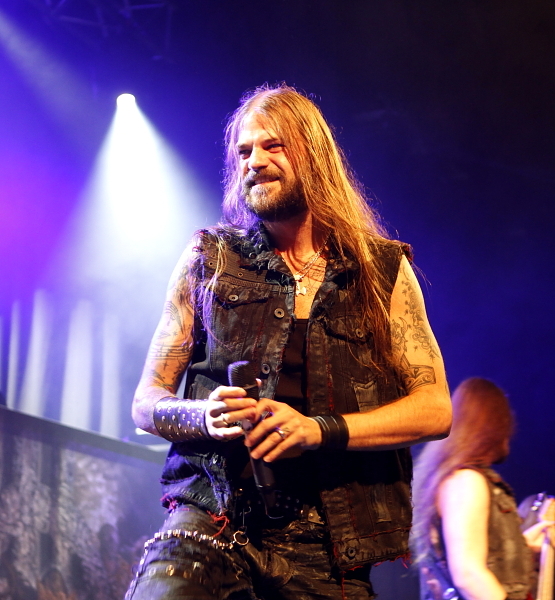 A really good show from Iced Earth – a band we need to see more of over here in the UK! After an interval the lights were lowered and to chants of Volbeat out blared Motörhead’s Born to Raise Hell. Then the lights went out and the Latin style intro to the album ‘Outlaw Gentlemen & Shady Ladies’ began, this reminded me of the introduction to Living Down with the Gypsies by Gypsy Pistoleros. Volbeat hit the stage and launched into Hallelujah Goat. Like an ad for Men in Black all were in black with Michael in a Country and western style shirt, Rob in a beanie hat with his hair held back in a banded pony tail and Anders just in a plain black sweater. With five albums to choose their set from Volbeat played a mix of songs with different influences, half a dozen being from the new album. From Metal (Guitar Gangsters and Cadillac Blood) to Punk (Radio Girl) to Country (Sad Man’s Tongue) to Reggae (Still Counting). Volbeat covered lots of musical genres they also covered the stage well, making sure all three guitarists spent some time at each microphone, which meant that wherever you were stood, you could get a good view of each guitarist at some point. Volbeat fans will know that Rob Caggiano was formerly in Anthrax, so it wasn’t a surprise when Michael annouced ‘We are Anthrax plus three new members!’ Michael switched to acoustic guitar to play a tribute to Johnny Cash with a snippet from Ring of Fire, staying on acoustic for the start of Sad Man’s Tongue he was joined by Rob playing some Hendrix style riffs. Michael transferred back to electric for a faster riff packed finish with the audience singing along. In response to the crowd singing, Michael said ‘I don’t believe you hear us on the radio? So you must have our album’ Perhaps not on the mainstream radio stations but, of course, Volbeat get played regularly on PlanetMosh so Michael should listen in one day! 16 dollars with it’s fast strong bass line reminded me a little of Motörhead in style and sound. Dead But Rising had similarities to Metallica’s For Whom the Bell Tolls, which wasn’t the first time I’d picked that up flavours of that one during this gig! Michael asked ‘Are you having a good time? Yes, then form a Circle pit’ Whether one was formed or not I couldn’t see, there wasn’t much room to move around, but a circle of two formed in front of me, and I could see a lot of hair flying around! It was really warm and at least one person fainted and had to be carried out. 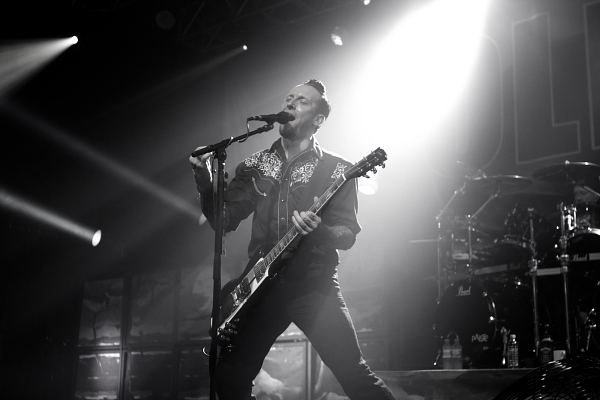 Volbeat’s Michael Poulson in monochrome! Volbeat had been signing their new album at FOPP, Manchester earlier that day and Michael said he had noticed a lot of people wearing Judas Priest t-shirts, which led nicely to a short a cover of the beginning of Breaking the Law followed by Still Counting starting off slow then suddenly getting faster before slowing again then speeding up again and ending the main set on a high. After shouts for more Volbeat, they came back on stage to give us a three song encore. Doc Holliday started with a Country and Western style intro then went into a riff packed faster pace reminiscent of Metallica’s Seek and Destroy. Michael dedicated the next song, a cover of Dusty Springfield’s I Only Want to be With You to his wife. Then the very last song Pool of Booze, Booze, Booza with essences of Black Sabbath, say Symptom of the Universe. The band took their bows and threw plectrums out to the audience and the concert ended with a paranormal experience and a UFO! Although I think it could actually be explained as a frisbee drumskin rather than a flying saucer! The lighting throughout the show was amazing. 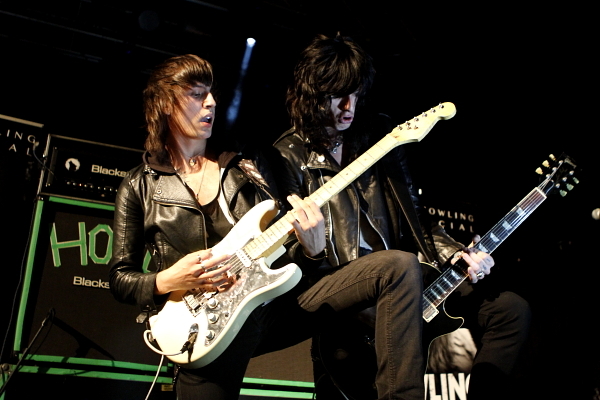 Overall a fantastic gig. 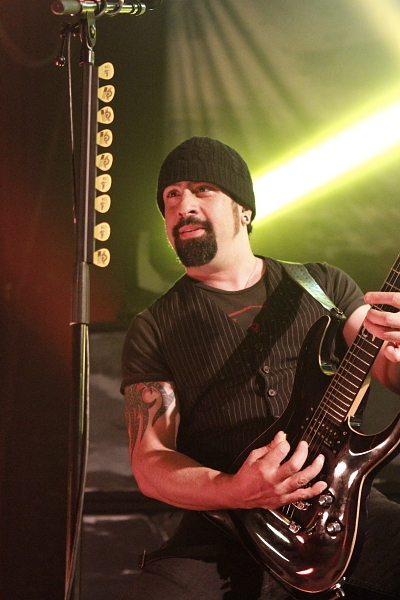 Rob has played with Anthrax in the Big Four concerts alongside Metallica, Slayer and Megadeth. Add Volbeat and next time it could be The Famous Five! 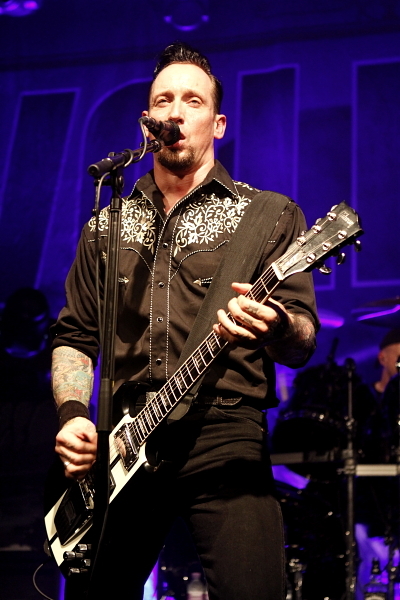 Volbeat’s Michael Poulson in technicolour! Volbeat: Outlaw Gentlemen & Shady Ladies, album cover.